Any thoughts on this, readers? Remote online hearings of social security appeals at the First Tier tribunal will begin this autumn in the next phase of courts modernisation, the senior president of tribunals has revealed. In a speech to the Administrative Law Bar Association published by the judiciary today, The Rt Hon Sir Ernest Ryder said that the tribunal would pilot ‘asynchronous conversations so that we can conduct some live hearings without the need for a disabled user to face a difficult journey to a hearing room’. Evidence will also be shared digitally with the Department for Work and Pensions, he said. >>Evidence will also be shared digitally with the Department for Work and Pensions, he said. 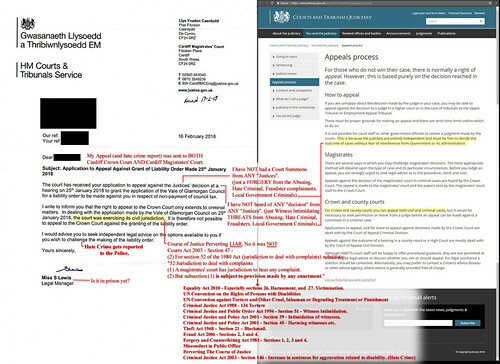 As in today tribunal should the DWP not be attending? I don’t have a problem with online evidence from the person concerned as long as they are happy for this to take place. But they may need support will this be allowed there are so many gotchas it sounds like they are just trying to speed up the process possibly at the expense of the claimant. I am worried on so many levels for my fellow disabled people who may not be quite as able being false down this route in the name of progress! So that’s David Gauke (Moj) speak for “Hostile Environment”? David Gaukes (Moj) *HAS* moved to a NO jurisdiction solution. Since when have criminal gangs been allowed to FORGE their own fake court summonses? been allowed to ignore Courts Act 2003, The Equality Act, Fraud Act, Criminal Justice and Public Order Act 1994 – Witness Intimidation, Misconduct in Public Office, Forgery and Counterfeiting Act 1981….. And ALL EVIDENCE sent to it. The only *Private Life* being discussed will be yours. So who owns the COPYRIGHT on that video stream? And is all that digital information stored as insecurely as everything else stored by that lot? I don’t doubt that it’ll all end up on Dark Web pornsites for public sector sickos to get off on. Do you mean “180 presenting officers”? “presenting officer” DWP speak for Course of Justice Perverting Criminal. Try finding a ‘Charity’ or ‘Law Centre’ that hasn’t already been BRIBED directly by the DWP and/or Local Government.